Winter has been around way too long this year. Probably too many of us have not kept up with exercise. We’re guilty so ton this gray day, we headed to the trail that begins next to the Lancaster County Public Safety Training Center and heads to the Northeast from there. We marked the trail in yellow above — from the start to the end of the yellow line is just a tad over a mile and a half so the round trip is just over three miles. 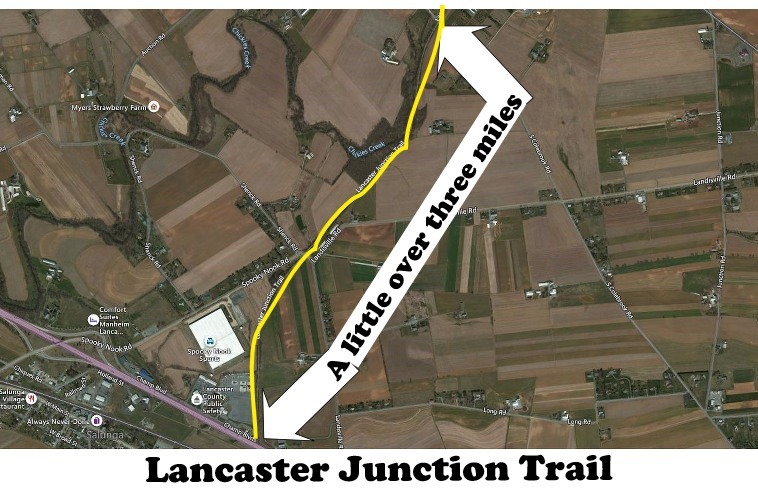 It’s just about a 5 kilometer route; a good practice route for the upcoming Lancaster YWCA Race Against Racism on April 27. These horses were munching the grass in this pasture. The trail passes by farm land like this just-plowed field. On the opposite side of the trail is the behemoth known as Spooky Nook Sports Complex with acres of parking and a hotel. Remember when this was a long-vacant Armstrong warehouse. An entrepreneur with a vision saw what could be. It seemed as every possible parking space was filled. Spooky Nook did get financial assistance from ” EDC Finance, a Lancaster-based nonprofit that helps local businesses get state and federal loans and grants.” Pretty sure Spooky Nook did not get a revolving loan to build the hotel. 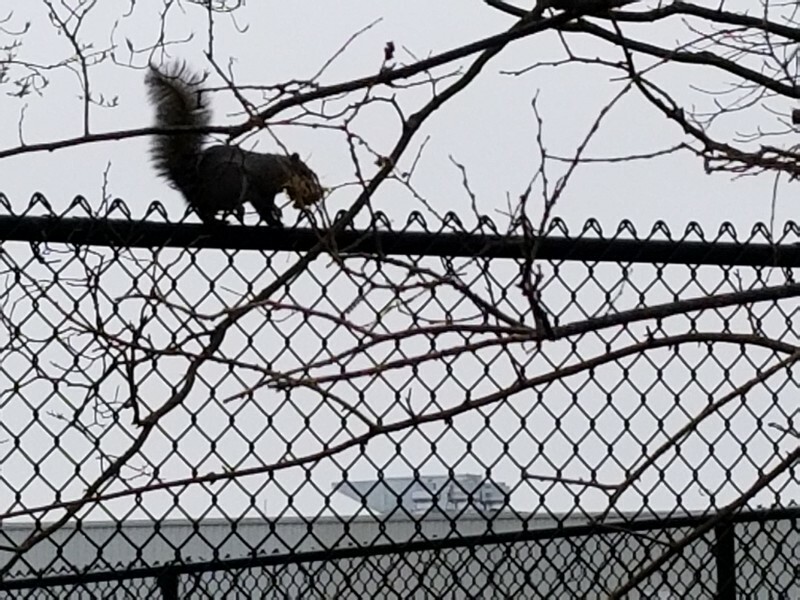 This squirrel with a mouthful of something, was fence walking on the security fencing around the perimeter of the Lancaster County Public Safety Training Center. 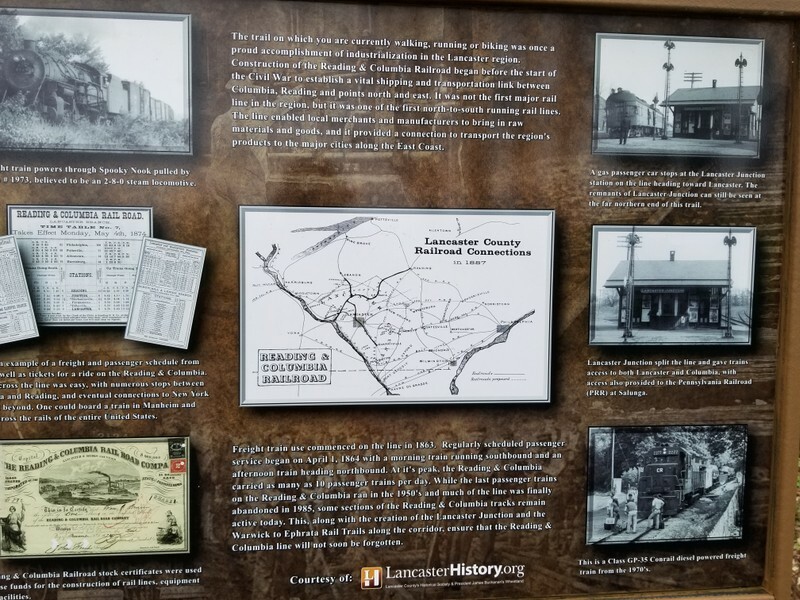 This complex is one of the absolute best investments the county ever made. Inside the wire, is emergency response equipment staged for deployment in the event of emergency situations. There’s the fire training structure, too. 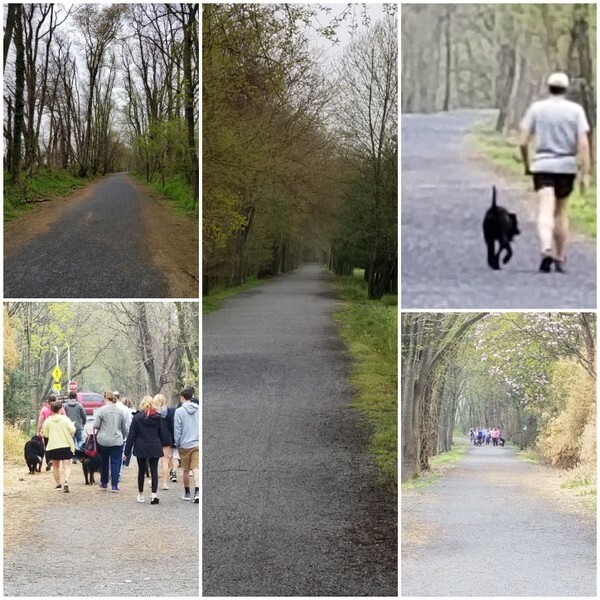 Along the crushed stone trail, there are lots of natural sights and smells, especially in the early spring. Winter was especially harsh with much of the vegetation; there were many downed trees and branches. 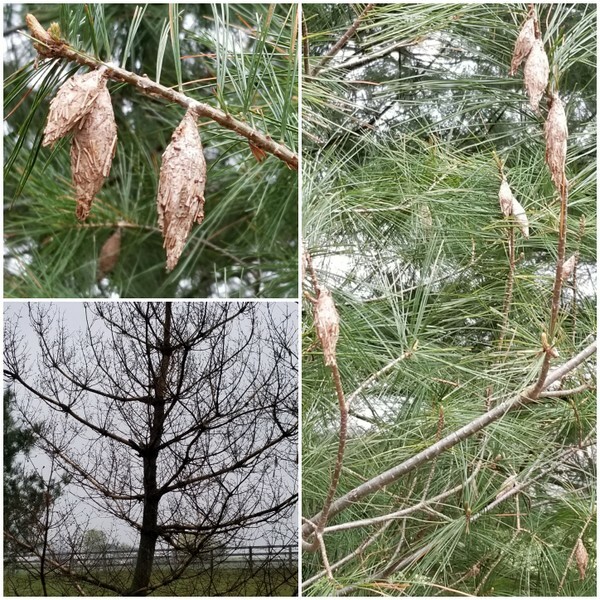 The bagworms (those brown clumps) have sown their scenes of destruction of some of the evergreens. Dandelions come up — no matter how harsh the winter is. 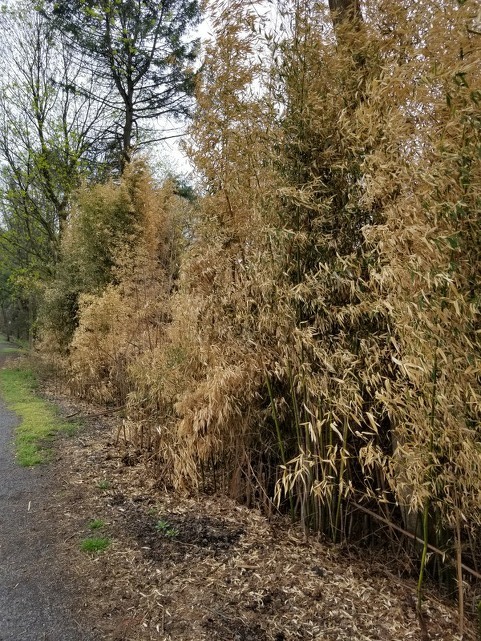 There’s a stand of bamboo — did not see any pandas, though. 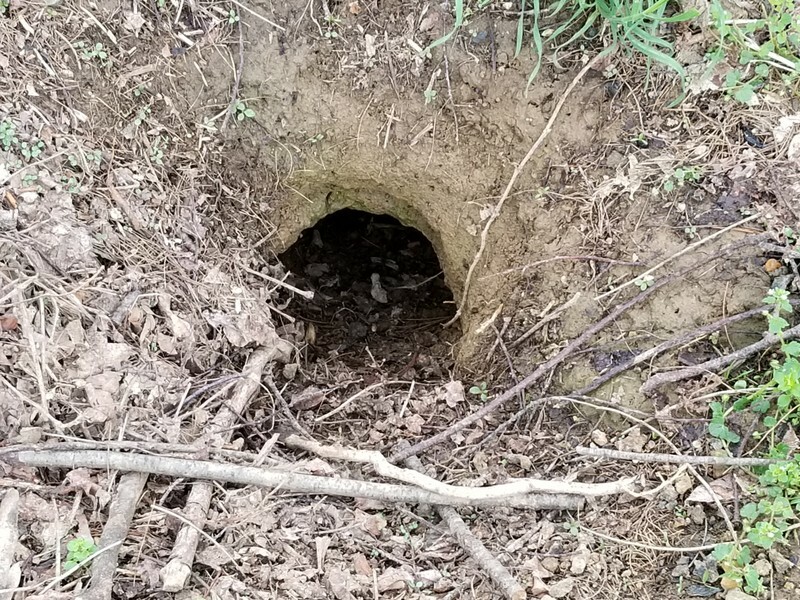 This sizable hole is probably a home for a ground hog. It’s always disturbing to see the carelessly flicked cigarette butts at the parking area. 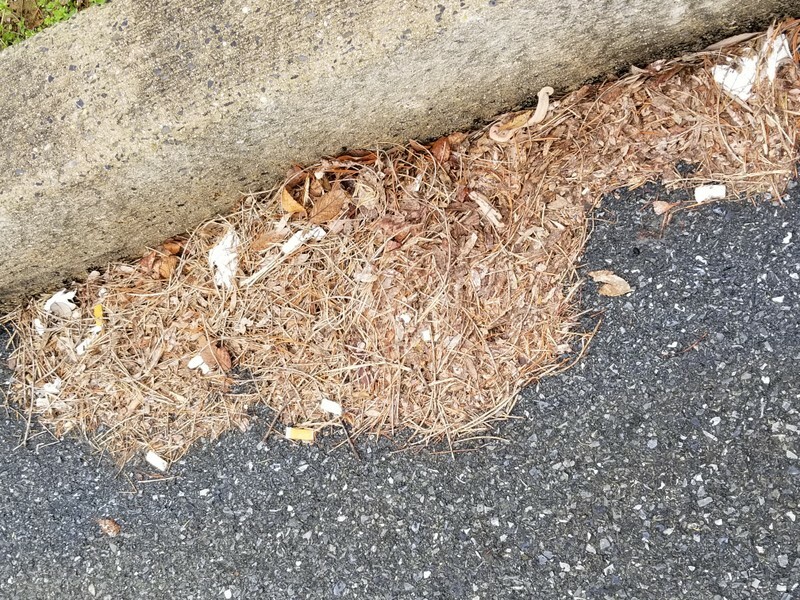 It’s kind of incongruous for walkers and bike riders to want to be outdoors and be on the trails, yet discard their cigarette butts willy nilly. Nice photos! I have no idea exactly where the trail is. Are there any new pipelines near it? There’s no evidence of pipeline activity on that short section of the trail.